Have you decided whether you are willing to save or transform lives as an organ and tissue donor? If so, have you discussed your donation decision with those closest to you? Do you know their decision? Organ and tissue donation and transplantation is something that can affect all Australians regardless of age, race, origin, faith or language. We each have the potential to donate life, and we or our loved ones may one day need a transplant. A transplant can give people a second chance at life. It can change the life of an individual, and the lives of their family, who have had to watch their loved one suffer. We have a world-class transplantation system in Australia that helps many people, but the reality is we need more people to become organ and tissue donors to allow more people to receive a transplant. Many people on the transplant waiting list are waiting because they suffer from a genetic disease or a severe illness or disease that leads to organ failure. In any month, on average 1500 Australians are on transplant waiting lists. Almost anyone can help others through the gift of organ and tissue donation. While a person’s age and medical history will be considered at the time of donation, you shouldn’t assume you’re too young, too old or not healthy enough to become a potential donor. The governing factors for organ and tissue donation are where and how a donor dies and the condition of their organs and tissues. Community education is a key element of the Australian Government’s national reform program, which aims to increase organ and tissue donation rates. The twin objectives of the reform program are to increase the capability and capacity within the health system to maximise donation rates and to raise community awareness and stakeholder engagement across Australia to promote organ and tissue donation for transplantation. Donation rates are improving, and in 2013 Australia had the highest donation and transplantation outcomes since national records began. In the 4 years to the end of 2013, since the DonateLife Network was established, there has been a 58% increase in the number of organ donors (391 donors in 2013 compared with 247 in 2009) and a 39% increase in the number of transplant recipients (1122 recipients in 2012 compared with 808 in 2009). It surprises people to learn that organ donation is a rare event. In Australia, less than 1% of deaths occur in hospitals in the specific circumstances where organ donation is possible. In 2013, this accounted for just over 700 potential donors. Many more people can become eye and tissue donors because the conditions in which someone can donate tissues are less limited. One donor can transform the lives of many people – there are often 20–30 recipients who benefit from one multi-tissue donor. Tissues that can be donated include eyes/corneas, heart valves, skin, bone, tendons and ligaments. Due to the rare opportunity for organ donation to occur, it is critical that every Australian family discusses and knows each other’s donation decisions. This is because in Australia every family of a potential donor will be asked to confirm the donation decision of the deceased. To help more Australians discover, decide and discuss organ and tissue donation the Organ and Tissue Authority, in collaboration with the Australian Curriculum Studies Association, has developed national school resources for Year 8 and Year 9 students. Available now for use by school teachers across Australia, these resources aim to bring the topic of organ and tissue donation for transplantation into the classroom to educate students on this topic. By introducing the concept and learning about organ and tissue donation at school, we can enable young people to explore the subject, reach their own decisions about becoming an organ and tissue donor, and feel comfortable discussing the topic with their family and friends. The DonateLife school education resources are designed to help teachers to develop student awareness and knowledge of the issues surrounding organ and tissue donation for transplantation. The school education resources align to learning descriptions in the areas of Science, English, Civics and Citizenship, and Health and Physical Education. The “Gift of Life” resources for Year 8 students introduce students to a range of issues relating to organ and tissue donation for transplantation. The “Have the Conversation” resources for Year 9 students explore the different perspectives on organ and tissue donation by considering some of the barriers to organ and tissue donation and ethical issues relating to transplantation. The Year 9 resources include the internationally acclaimed Australian short film The Last Race. Teachers can also access a classroom resource pack, “Donating for Life: the Science of Organ and Tissue Donation”, specifically for Year 8 and Year 9 science teachers. This resource was produced by the Royal Institution of Australia (RiAus) through an Organ and Tissue Authority Community Awareness Grant, and introduces students to a range of issues relating to organ and tissue donation for transplantation. Students explore sensitive issues through short films, personal stories and factual texts. These resources complement the existing DonateLife school education resources, which cross several subject areas and are also aligned with the Australian curriculum. These resources are now available to Australian school teachers on both the Education Services Australia portal, Scootle, and the DonateLife website (www.donatelife.gov.au). We can each make a difference by discovering the facts about organ and tissue donation, making and registering a decision on the Australian Organ Donor Register and, most importantly, asking and knowing the donation decisions of loved ones. 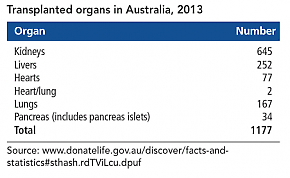 For more information about these resources, visit www.donatelife.gov.au.